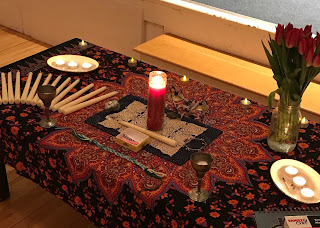 The November 2018 first Sunday healing circle falls shortly after Samhain. It is a time to connect with our ancestors and honored dead. Our circle this month will be focused on this special time of year. We will take a guided journey to meet an ancestral healing ally who can be your guide in your personal healing journey. Time will be provided in circle for participants to journal or create a piece of sacred art about their journey. There will also be a special gift for each person who attends. Because of the nature of this months circle, it is limited to 20 people and requires preregistration. If you have any questions please feel free to email me directly at joiegrandbois@gmail.com. To register to attend please complete the form below. This monthly circle is supported by your donations. These donations cover the cost of renting the space and providing ritual supplies. The suggested donation is $5 but you may give more if you feel called, and no one is turned away due to lack of funds. Each card of the tarot's Major Arcana can be said to represent an archetypal step on our path through life. We begin as the The Fool and make our way to The World only to find ourselves The Fool once again. At other times we may find we are stuck at a certain point on the path, unable to move forward, questioning why we are here. Understanding the wisdom contained in the cards can give you a helpful, and visually beautiful, guide to where you have been, where you, and where you are going. 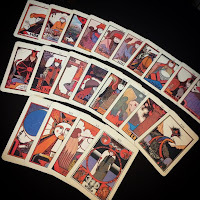 I usually offer this course in the spring, but I believe the dark time of the year is perfect for exploring The Fool's Journey from light into darkness and into light again as we make our way through the Major Arcana. It allows us to accompany The Fool on our own inward journey as the year turns. A discussion of the meaning of the card. Journal prompts to help you explore the card more deeply. A daily affirmation or meditation related to the card. You will also be invited to join a private Facebook group where you can discuss the cards, the journal prompts, and other explorations. Each Monday at 7PM EST we will have a live video call where I will share more information about that week's cards and answer any questions you may have. I will also offer a short guided meditation on one of that week's cards. No worries if you can't join the call, links to the recordings will be shared by email and in the Facebook group. In my 30 years of studying the tarot I have found the Major Arcana to be a source of guidance and wisdom for myself and my tarot clients. Whether you are totally new to the tarot or are seeking to deepen your knowledge of the cards this course will help you establish a solid understanding of the Major Arcana and how it may be used a source of guidance and inspiration. I like to keep my offerings accessible to all regardless of income, so this course is being offered on a sliding scale of $10.00 to $80.00. Please use the button below to register for the course and submit your payment. Be sure to include the email address you will be using to receive the course emails.